The Weekend Gourmet: My Visit to Con' Olio Oils & Vinegars in Austin...Featuring Strawberry Balsamic-Chicken Pizza AND a Two-Bottle Giveaway!! 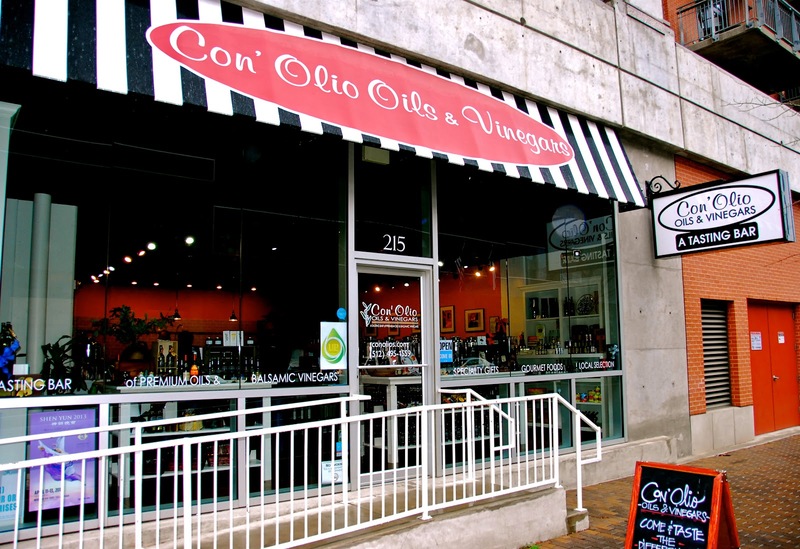 My Visit to Con' Olio Oils & Vinegars in Austin...Featuring Strawberry Balsamic-Chicken Pizza AND a Two-Bottle Giveaway!! During a recent trip to Austin, Michael and I visited Con' Olio, an artisan olive oil and balsamic vinegar shop. Husband and wife owners Jeff and Tabitha Conarko opened the first Con' Olio in 2009 and have since added a second location. For those of you who aren't within driving distance of Austin, they offer their products via an online catalog and ship across the country. We met Jeff at the Downtown Austin location for a tour and tasting of some of his favorite products. Jeff was very welcoming and knowledgeable, teaching us how to properly taste olive oil. Much like wine, olive oils from different varieties of olives -- and regions of the world -- have vastly different flavors. Some olive oils taste more "green," while others are peppery...some are bold, and others are mild. 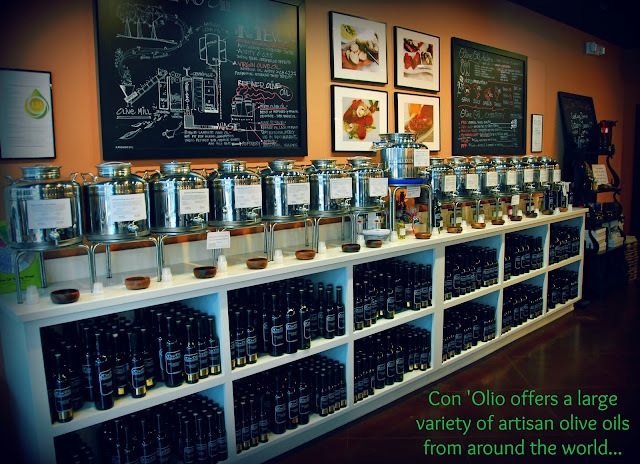 One of the best things about visiting Con' Olio is that you can sample every variety of olive oil and balsamic vinegar before you take it home! You know exactly what you're buying and if it's a good fit for your palate. 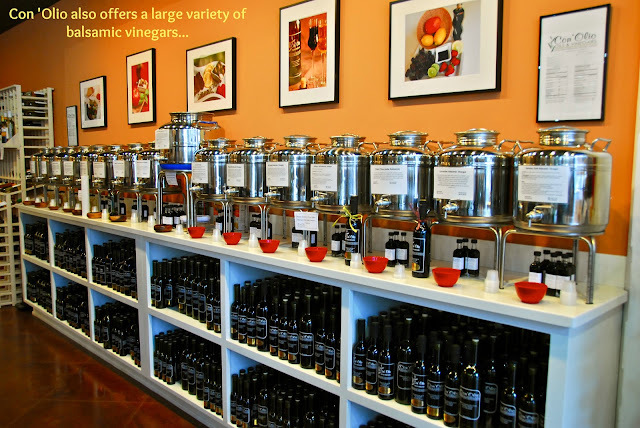 They offer single-olive oils, as well as ones infused with flavors like garlic, chile pepper, and even butter. Each container has a card in front that explains its origins and suggested uses. They also have a huge selection of balsamic vinegars in both dark and white varieties. Most flavors are so smooth that you can sip them straight from the sample cup without puckering up. They have the largest variety of flavored balsamic that I've seen...so many were mind-blowingly good! In the end, I selected a few mini bottles to take home and play around with in my kitchen. Among these were flavorful Arbequina Spanish, Organic Natural Butter, Blood Orange, and Tuscan Herb Olive Oils...and Strawberry Balsamic and Cranberry Pear White Balsamic. I loved experimenting with all of the varieties, but decided to spotlight the Blood Orange Olive Oil and the Strawberry Balsamic in a feature recipe. As soon as I saw my friend Chris's recipe for Strawberry Balsamic Pizza with Chicken, Sweet Onion and Applewood Bacon at Cafe Sucre Farine, I knew that it was the perfect inspiration for what I wanted to do! I made a few tweaks to her original recipe using my Con' Olio goodies and came up with Strawberry Balsamic-Chicken Pizza. Trust me...it's all good! I opted to make two individual-sized pizzas, and I brushed each pizza with the Blood Orange Olive Oil. I replaced the balsamic in the sauce with the Strawberry Balsamic. I also used pancetta and thinly sliced purple onion in place of bacon and sweet onion. Finally, I topped my pizza with sliced green onions rather than chopped cilantro since we don't eat a lot of cilantro. Trust me...the ingredients may not look like typical pizza ingredients, but it's completely addictive!! Step 1: Preheat oven to 450. Place parchment on a large rimmed baking sheet. Place a small ball of your favorite pizza dough on the parchment and carefully push out to 1/2-inch thickness using your hands. [NOTE: I bought refrigerated dough at Trader Joe's, and it was very easy to work with.] Repeat the process with a second ball of dough. I'd estimate the pizzas were 6-8 inches when pressed out. Brush each pizza crust with Con' Olio Blood Orange Olive Oil. Step 2: Combine the following ingredients in small bowl: 1/2 cup strawberry preserves, 1/4 cup Con' Olio Strawberry Balsamic, and 1 tsp. sriracha. Whisk well to combine. Place 1 cup of shredded/chopped chicken breast meat in a bowl and stir in 2 tbs. of the sauce. Spread the rest of the sauce over each of the pizza crusts. Top each pizza with 3/4 cup Italian four-cheese blend, 1/4 cup cooked diced pancetta, and a few thin slivers of purple onion. Step 3: Top each pizza with half of the reserved chicken, then sprinkle a bit more of the four-cheese blend on top. Bake the pizzas for 8-10 minutes, until the crust is golden-brown around the edges. Make sure to rotate the pan halfway during the baking time. While the pizza bakes, finely chop strawberries until you have 1/3 of a cup. Thinly slice 2 green onions as well. When the pizzas come out of the oven, top each with half of the berries and green onions. Drizzle with a bit more of the Strawberry Balsamic and cut into quarters. O-M-G. I'm not joking when I say this is some amazing pizza...the sauce is sweet-tangy-spicy and the citrus note from the olive oil is a whisper in the background. The cheese, onions, and chicken are savory goodness...but the thing that takes this pizza over the top is the fresh strawberries and green onions on top. They make this pizza sublime...not only did it taste good, it was GORGEOUS! Not your average pizza for sure, but totally mind blowing. One of you is going to get a chance to reproduce this pizza in your kitchen. Con' Olio is going to give one of you a gift set that contains a bottle of the Blood Orange Olive Oil and Strawberry Balsamic featured in this recipe! 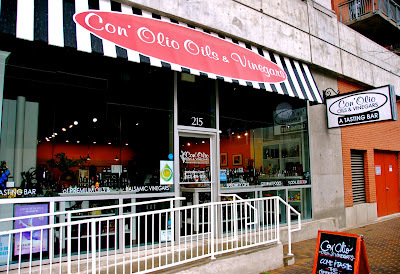 To enter, simply visit Con' Olio's website and check out their huge variety of olive oils and balsamic vinegars. Then come back and leave me a comment telling me the most unexpected flavor that you found in their catalog. Make sure to leave include your e-mail address. I'll take entries until this 1159 p.m. this Saturday, April 13th. The winner will be notified by e-mail on Sunday. Good luck! !